Short-term and long-term financial planning helps producers manage volatile markets. As our experience with increased price volatility in the dairy industry - now nearing and building towards the 20th year - expands, so does our understanding of successful business strategy in that environment. Many in the areas of economics and business management are recommending the adoption of both short-term and long-term financial planning to be best prepared to manage in the face of volatile markets. Price volatility not only creates challenges for managing Cash Flow (Liquidity) but also affects Solvency and Profitability. Mike Boehlje, Center for Commercial Agriculture at Purdue University explains that when price volatility on both sides of the profit equation (product sales prices and production input prices) increases, the effect on margin (profit) volatility is even more dramatic. Chronic and even short-term significant Cash Flow shortages negatively affect Balance Sheet and Farm Earnings Statements. Much has been written about business performance during the memorable year 2009. But, how well were Wisconsin dairy farm businesses prepared going into 2009 and were losses regained in 2010? The Agricultural Financial Advisor (AgFA) program offers dairy producers and those who advise them farm financial performance information from the Wisconsin dairy industry and beyond. In addition to financial performance of the home farm business, AgFA is a source of financial benchmarking data to compare individual business performance to 400-500 dairies. The database also offers opportunities to answer the above questions relative to business performance. Generally considered an excellent year to be in the dairy business, 2008 is a good place to begin to benchmark a level of high business performance. A total of 548 dairy herds were summarized in 2008 from the AgFA database to establish performance levels of Profitability, Solvency and Cash Flow. The range of performance calculations as well as averages and medians were identified. A median number represents the middle number in a ranked list as compared to an average which is the calculated value (sum of values divided by the number of observations) of all numbers submitted. In a range consisting of extreme highs and lows, median values reduce the skewing effect of extremes. Rate of Return on Assets (ROROA), an indication of business profitability, demonstrates the wide range of performance among summarized businesses. Maximum returns topped out at nearly 40 percent with minimums closer to -15 percent generating an average of 5.88 percent. The median value for all 548 businesses was 5.22 percent. The largest number of contributing farms (341) earned ROROA between 0-10 percent. The next greatest number of farms (118) turned in ROROA values between 10-20 percent. Values for Unpaid Labor and Management ranged between $0 and nearly $600,000 with a median value exceeding $30,000. Net Profit Margin based on economic valuation of assets ranged from -400% to over 60% with a median of 14.71%. A similar range was registered for Net Farm Income (NFI) spanning from less than -$2 million (M) to greater than $3M. The median NFI was nearly $80,000 and the median Equity level was a strong 79 percent. Consistent with other measures, Equity dollar values ranged from strongly negative to extremely positive. Asset Turn Over Ratio (ATO) an indication of efficiency of asset management to generate revenue ranged from just above zero to over 2.0 with a median value of 0.38. Assessing average and median performance values indicates 2008 was a "good" year for the typical Wisconsin dairy business. It was a "great" year for some but not for all. An individual business manager may use this information in comparison to their own to ask/answer appropriate questions about differences. Working Capital (WC) (Total Current Assets – Total Current Liabilities) ranged from almost a negative $3M to over $3M. Size of operation as well as level of debt and owned assets causes this measure to vary significantly. The largest number of farms registered WC totals between $100,000 and $500,000 with a Median over $130,000. The second largest number of farms had between $0 and $100,000 in WC during 2008. Due to the skewing effect of business size on WC, the use of WC: Gross Revenue and WC: Operating Expense ratios allow comparisons across operations without regard to business size. WC: Gross Revenue ranged from less than -$1of WC per dollar of Gross Revenue to over $2. The largest number of operations filed values between $0 and $0.50 Working Capital per dollar Gross Revenue. WC: Operating Expense ranged from over $6 to well under -$1 with the largest number of observations from $0.50 to $0. Median values for WC: Gross Revenue and WC: Operating Expense were $0.27 and $0.47 respectively. Since WC represents inventories as well as liquidity generated during the year keep in mind these values are affected by business performance prior to as well as the summarized year. Certainly the typical 2008 farm business was well positioned from an Equity standpoint (79 percent) to withstand short-term losses. This was not the case for all. While median NFI and WC: Gross Revenue levels were solid, values for ROROA and ATO were adequate while Net Profit Margins were slightly vulnerable. All-in-all, Equity and cash position should have prepared average to better farm managers for the impending Cash Flow crunch to come. Cost control and revenue production efficiency represented areas of concern for some farms. 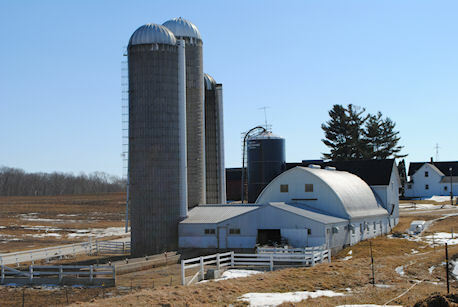 Given the severity of 2009 financial conditions, Wisconsin dairy farms weathered the storm better than they might have. Median ROROA fell from 5.22 to -1.32, Net Profit Margin declined from 14.71 to -4.28, Net Farm Income from nearly $80,000 to less than -$18,000. ATO fell from 0.38 to 0.29. However, Equity levels only lost 3% - 76% from a previous 79% in 2008. Total Liabilities increased reducing Total Equities. The decline in cash flow is documented in WC totals and ratios. Median levels of WC dropped from over $130,000 in 2008 to around $100,000 in 2009, 82% of previous year values. WC: Gross Revenue actually increased from 27% to 32%, likely because of increased inventories of grain and other Current Assets, as well as revenue falling in relation to the value of those inventories. WC: Operating Expense fell slightly from 47% to 43%. The largest number of farms reported WC: Gross Income (351) and WC: Operating Expense (241) levels between $0 and $0.50. The issue here may be a question of whether levels of WC were adequate versus the relatively small change from 2008 to 2009. While farms at all levels of financial performance registered reduced values in 2009; businesses at lower performance levels tended to change to a greater degree than those at higher levels. For example, farms with higher levels of WC: Gross Revenue between 2008 and 2009 retained more capital in 2009 relative to 2008 with increases of 15 percent from 2.52 to 2.90. Farms at lower performance levels saw reductions in the 45 percent range declining from -1.05 to -1.54. Farms with higher levels of WC: Operating Expense saw reductions but still positive values of 22 percent and those registering lower and negative levels saw additional losses of 17 percent. If businesses at the lower and negative levels also borrowed additional funds to pay bills thus limiting additional reduction in WC: Operating Expense compared to businesses at higher performance levels, (17% vs. 22%) Equity also was negatively affected. The comparisons are database summaries from year to year. No attempt was made to track same farm performance between 2008 and 2009. As mentioned above, businesses with strong Equity, Solvency and Liquidity positions seemed to continue to realize relatively strong performance during 2009. Those at lower levels of performance in these areas may have experienced additional stress during this year of economic challenge. Some measures of dairy farm financial success improved in 2010 while others did not. Median ROROA moved from -1.32 in 2009 to 2.49 in 2010. Net Profit Margin improved from -4.28 to 7.0, Net Farm income from -$18,251 to $48.439 and ATO increased from 0.29 to 0.36. Of limited concern but of note are Equity levels which continued to decline 79% to 76% to 74% in 2008, 2009 and 2010 respectively. Total Liabilities increased again over 2009 resulting in another decline in Total Equity by 6.9%. So while 2010 profitability improved over 2009, the financial drain realized the previous year likely resulted in increased borrowings which remained to be repaid at the end of 2010. The median increase in liabilities of $19,462 per farm only partially explains the $62,870 loss in Total Equity. The balance of this difference may be due to Balance Sheet adjustments to account for declining asset values from 2008 to 2009 to 2010 i.e., cattle values as well as accounting for perhaps the sale of assets to generate cash during 2009. The improvement in 2010 business conditions did not translate into improved absolute WC values or ratios. Median levels of WC dropped once again to $106,314 from $108,258 in 2009, 98% of previous year values. Median Working Capital in 2008 was $132,362. WC: Gross Income fell to 25% from 27% in 2008 where it was 32% during 2009. WC: Operating Expense also declined to 39% from 43% in 2009 and 47% in 2008. Cash availability was a continuing challenge during 2010 for the typical farm summarized in this database. The largest number of farms reported WC: Gross Income (356) and WC: Operating Expense (249) levels between $0-0.50. The percentage of farms at the higher levels of positive Working Capital (above $100,000) were fewer in 2010 (41%) than during 2009 (95%) but greater in the $0 to negative range at 5% in 2009 relative to 59% in 2010. However, the range of farms with zero to negative Working Capital collapsed with all 263 farms below $100,000 WC in 2010 restricted within the range of $0 to $100,000. In other words, more farms stayed out of the negative WC area in 2010 as compared to 2009 but fewer also attained values at the higher levels. The net result is it will take more than one year at closer to normal financial performance for the typical dairy farm business to make up for the significantly negative 2009. Also of note is the time lag to regain Equity and WC levels following a tough year relative to profitability measures. According to Dale Norquist of the Center for Farm Financial Management at the University of Minnesota and Del Lecy, Associate Dean at Central Lakes College as quoted in the Aug. 11, 2011 issue of Progressive Dairyman, "Liquidity is a chronic concern for dairy farms." Due to regularity of milk marketings as compared to other agricultural enterprises, dairy producers have historically operated at WC: Gross Revenue levels of around 20% versus 47% for crop producers. Norquist and Lecy identify dairy farm's relatively low level of WC: Gross Revenue as a risk management concern. They observe, given the continued volatility of milk prices and variable expenses that, "working capital is one of the best risk management tools a dairy farmer can have" in their toolbox. They also comment that the volatility documented between 1997 and present "suggests the need for short-term and long-term planning is critical now more than ever." All business managers are better off financially to keep capital invested and working for them. Thus, many dairy business managers have limited the amount of working capital residing in inventories including cash accounts. This is a wise economic strategy as long as two considerations are evaluated; ROROA and WC levels needed to keep current on bills as they come due. As long as the business's ROROA is higher than the return on cash/inventory investments or when cash is borrowed, higher than the cost of borrowed capital, minimal WC may be indicated. Also of importance is the level of WC maintained to keep current on Current Liabilities which increases during tough financial years in comparison to good years. It's a balancing act. AgFA data indicates Wisconsin dairy farm businesses tended to operate at minimum levels of WC during 2008-2010 even or perhaps as a result of good years like 2008. A higher level of retained Working Capital may be indicated to further limit price risk exposure. Cost control and revenue generation efficiency may be other areas of opportunity for typical dairy farm businesses. Consider annual WC, Cash Flow, Solvency and Liquidity planning for your dairy farm business. While identifying and tracking opportunities to manage financial risk, also consider the available benefit of lowering personal stress and improved mental health as well as business competitiveness. Cash Flow planning is a necessary prerequisite to the successful utilization of any formal risk management tool. Without it risk may be increased versus lowered. Are you prepared to capture those advantages? Contact your local UW-Extension Office, farm records association field staff or technical college farm trainer for more information. Ask about the "Working Capital Decision Support System" and associated information. This educational program is support by a North Central Risk Management Education Center Grant. Agriculture and natural resources is a program of the University of Wisconsin-Extension, Cooperative Extension in partnership with local, state and federal government in each Wisconsin county. Bolton is a UW- Extension dairy agent with the Center for Dairy Profitabilty.